Next week on Billy Wilder Film Club: Double Indemnity! This was a fun caper kind of a film, with a rollicking pace and a lot of gags, many of them visual. It was fun and silly and strikingly light given the weight that the cold war must have had in 1961. I was most interested in the ideology: Truly an immigrant's movie, it wholeheartedly embraced Americanism and capitalism, all while acknowledging it's absurdities. But as absurd as a Coke executive might be, he is never as absurd as a strident communist in Wilder's book. I presume Wilder had the life experience to know what a real communist might be like. Even as the movie is firmly about a very specific time, and even while the stereotypes - gender and ethnic - abound - it didn't feel especially dated. If anything it just felt kind of mythical, like about a pretend world that never was, which I guess it is. I remember it having a number of absurd set pieces but the only one of them I can remember now is the interrogation set to "Itsy Bitsy Teenie Weenie Yellow Polka Dot Bikini". I'm pretty sure I would crack under that kind of treatment, too. Truly an immigrant's movie, it wholeheartedly embraced Americanism and capitalism, all while acknowledging it's absurdities. That's a great observation, it is really an immigrant's movie, but I perhaps wouldn't go so far as to say it entirely embraces Americanism given the number of references to Little Rock and the south at the moment the battle for civil rights was being waged there. "Scarlett" coming from Georgia and hints about her father's attitude towards, um, tradition in the south, the joke about making sure to say the civil war was a draw for example, go a ways to suggest not everything's rosy in the US. The US though does happen to be the big power, as represented by Coke, so that bulldozes through a lot of difficulties for everyone. That the movie could mock the Nazis, the Soviets, and the US, among many targets, is something that feels like the domain of an outsider, someone who is distanced a bit from all of it, but who's also witnessed it all up close as well. Wilder and crew engage in tempered exaggeration of the qualities of each area, but place the failings as human more than of nationality. Germany East and West adapts to its new masters, the US and the Soviets, who are engaged in a push/pull relationship over their territories. The US has the upper hand and freedoms the Soviet side doesn't, which makes it the better, but the differences are largely surface, or more to the point, in capital. Piffl and Peripetchikoff can switch to capitalism and become successes without much difficulty just as one would expect MacNamara could find success on the other side given what we come to see of him. It isn't that the systems they are operating in are equal, but they are all open to manipulation, which we see MacNamara so handily do. The movie is like a nutty mix of Ninotchka and The Front Page, where the one who controls the flow of events can set the outcome and where the stakes are in obtaining desired goods. Even MacNamara though is prone to mistaking the goods he can obtain by manipulation for things of value when that which isn't as manipulable, his family could be lost for the efforts he places towards the wrong focus. I don't want it to sound though as if the movie is indulging in some sort of big "message" when its jokes go all over the place, mocking Cagney's own persona and movie history on a number of occasions among all the rest. It's hard to even know what all the possible jokes might be at this late date, since, for example, the early encounter with the flight crew has Mrs. MacNamara referring to the navigator who won Scarlett as "Lucky Pierre" which is also the title of a movie famous for being the first color nudie film released earlier in the same year as One, Two, Three. Coincidence or joke? Given the amount of references and pace of the humor, I'd guess the former, but who knows? This is a film that never fails to make me laugh out loud at times, and not always at the same moments, but it is of its time in a way that makes it tricky to recommend to anyone who wants their movies to reflect today's attitudes and tone. One, Two, Three may or may not suit some for its breeziness in speaking of Nazis, the south, Soviets, not to mention its, um, handling of Fräulein Ingeborg. For those who see it in the context of its era it can be hilarious and still suggestive of some implicit deeper values, for the rest it can probably still be damned funny, but they might grrrr at it a lot more too. It might have been that way for me too if it wasn't for the sheer breadth of its glance at human absurdity. The movie renders all its characters ultimately ridiculous in their exertions, MacNamara only marginally less so for being most in control of his foolishness. That ridiculousness stands in for deeper horrors that we aren't able to laugh at, but the folly of man remains constant in life and fiction creating the analog that allows us to laugh at what we would otherwise cry about. The movie is at once once both exaggerated and reduced from the way things really are. It plays up the small idiocies to take the place of the bigger atrocities, hiding them in plain sight behind an Itsty Bitsy Teenie Weenie Yellow Polka Dot Bikini in a sense. There are simply too many good bits to even try to recount, and a few moments that feel a little flat for feeling a bit too stagy or forced, but the cast and crew is excellent all around, with Wilder in top control of the pace of his and I.A.L. Diamond's adaptation of Ferenc Molnár's play. Cagney was an ideal choice for MacNamara and perhaps a bit of an unexpected one at that point in his career, though maybe that's hindsight talking since it's hard to arrange one's perspective to see Cagney starring in something like this in 1961, a year after Psycho hit the big screen. Perhaps though it shouldn't be since the social tensions that made it possible to make Psycho are some of the same informing One, Two, Three, they just come at those feelings from very different angles. As an aside, Ferenc Molnár who wrote the play One, Two, Three was based on, Egy, kettő, három, was also an immigrant who escaped Hungary during WWII. A number of his works were made into movies, many quite enjoyable, so some credit is surely due to him for this as well. 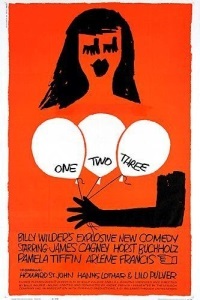 One, Two, Three didn't fare all that well at the box office, bad timing with the Berlin Wall being built perhaps, but it got good reviews and has retained a following and had some success in rereleases over the years, so it wasn't seen as a complete failure, just a financial loss. It was the last film Cagney worked on until Ragtime, in part for the sheer volume of lines he had to learn and the pace demanded by Wilder, according to Wikipedia. He also was miffed about Buchholz being a big scene stealer. Heh. Well, I was supposed to post Double Indemnity tonight but I guess I'm not too good at looking at previous posts cuz this one was already posted (thanks for being fully awesome, Joseph Conrad is Fully Awesome): Double Indemnity. Feel free to head over and revive that conversation over there. Unfortunately, I've gotten snowed under with family medical issues, so I can't continue to Billy Wilder Film Club just now.. maybe in the future.